Children's Book Prizes: An Evaluation and History of Major Awards for Children's Books in the English-Speaking world. 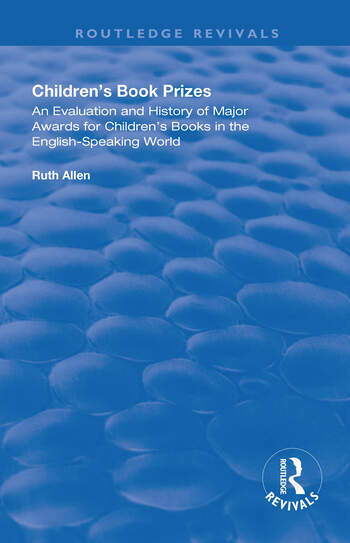 First published in 1998, this book is the first comprehensive survey of the awards made to children’s books in the English-speaking world. The Volume covers nearly forty different prizes including well-known and established ones such as the Newbury Award, prizes instigated by the commercial sector such as the Smarties Prize, as well as nationally sponsored awards and prizes for illustrators. Detailed lists are provided of the winning titles and, where appropriate, the runners-up in each year that the award has been given. Ruth Allen also presents some fascinating and often entertaining insights into the motivations behind awards and how they are views by authors, illustrators, publishers, librarians, booksellers and potential purchasers. The various criteria applied by judges of these awards are also examined, with an assessment of whether they have always achieved the ‘right’ result. This Volume is both a useful guide for adults wishing to buy good books for children and an important tool for those researching the history of the children’s book industry. 1. About this book. 2. Books and children. 3. The Newbery Medal (USA). 4. The Carnegie Medial (UK). 5. The Caldescott Medal (USA). 6. The Kate Greenaway Medal (UK). 7. Choosing the best in the field – The Boston Globe – Horn Book Awards. 8. Not just pretty pictures – awards for illustrations. 9. Coming From Another Angle - Awards With Special Intentions. 10 Commercial breaks – awards sponsored by big business. 11. Around the World- English-Language children’s book awards in Australia, Canada, Eire/Republic of Ireland, New Zealand and South Africa. 12. Did the Right Book Always Win? 13. What the Authors and Artists say. 14. What the critics and Librarians Say. 15. Some Conclusions.